It is something that we are all given. With that life, we make choices. With those choices, we affect our life but more importantly, we affect the lives of others. This weekend was a hard one. My husband’s family suffered a great loss. An unexpected loss at that. Times like these reaffirm my belief that we should always let people know how much they mean to us. After such a long weekend out of town, we arrived home this afternoon and I was hungry for fresh vegetables. A basic stir fry is the easiest way to use up whatever vegetables you have lingering in your fridge. Feel free to sub any fresh or frozen vegetables that you may have around or in the garden. 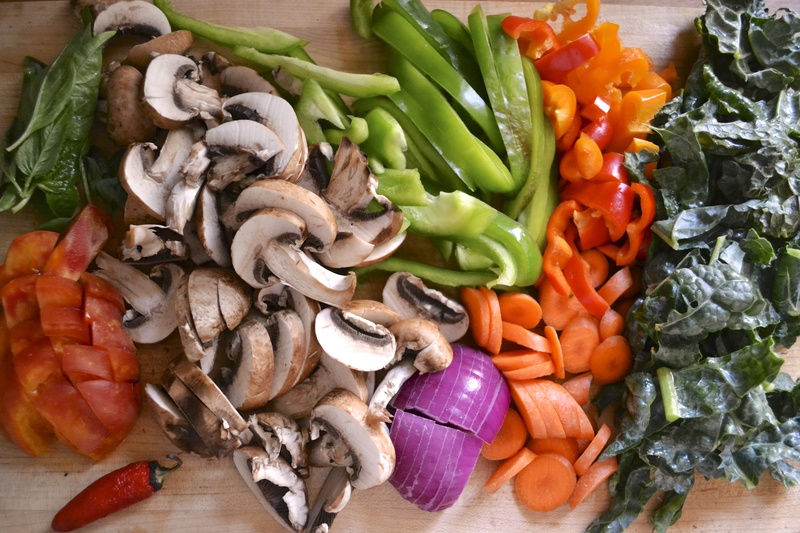 Stir Fry Tip Numero Uno – Cut all your veggies up in advance and have everything prepped and ready to go. Stir Fry Tip Numero Dos – Have a good stir fry sauce recipe. I have also included my basic stir fry sauce recipe which is adapted from the Moosewood Cookbook. Because we have recently given up soy products, I used coconut aminos in place of soy sauce. It is available at any natural food grocer or online. This recipe would also taste great with coconut milk and curry. Mmmm. 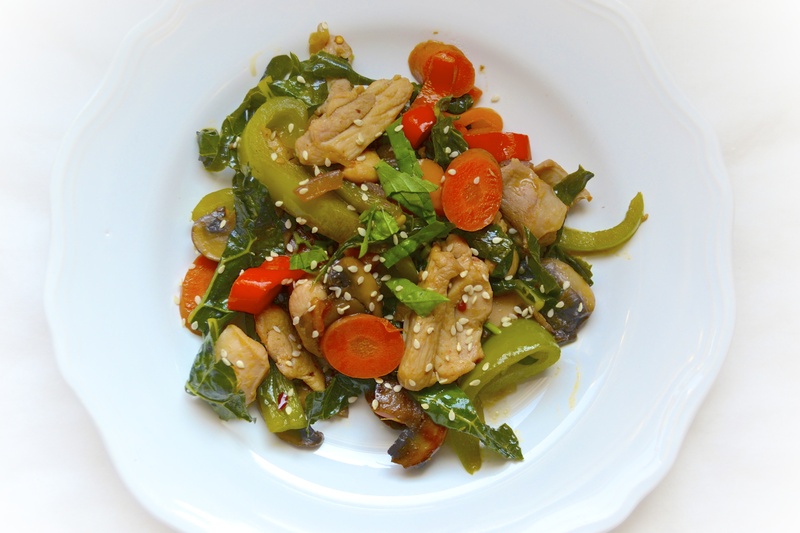 For other stir fry ideas, check out the Food Matters Project here. 4 cups of vegetables: bell peppers (cut into 1/4-inch strips), carrot (cut into thin slices), mushrooms (sliced), kale (chopped), spinach, green beans, cauliflower, cabbage, tomatoes, broccoli, etc. Combine stir fry sauce ingredients in a small bowl and set aside. Over medium heat, heat 1 tablespoon of coconut oil in a large skillet. Place diced chicken in skillet with half of the stir fry sauce. Cook until browned and cooked through (about 10 minutes). Stir frequently. When cooked through, remove chicken from skillet and place in a separate bowl. In same skillet that the chicken just was removed from, add another tablespoon of coconut oil. Allow to melt (30 seconds). Turn heat to medium-high. Add onions and salt and stir fry for about 2 minutes. Add all other vegetables except leafy greens (spinach, kale, chard) and tomatoes. Stir fry until they begin to get tender. 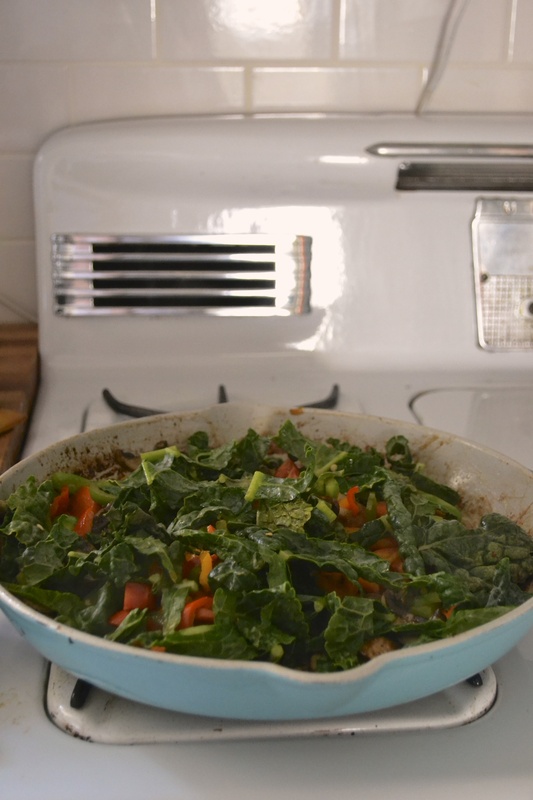 Add tomatoes, leafy greens, and the remaining stir fry sauce to the skillet. Keep the heat medium-high. Stir frequently. The sauce will begin to thicken. Add chicken, red pepper flakes, and basil. Stir until heated through and incorporated. Remove from heat. Top with additional basil and sesame seeds. i love this! all the veggies are my basic go-tos on many dinner nights… your stir fry sauce is something else… i like some ginger in my stir-fries but never thought to use lime… what a great flavor booster it must be. yum! A fresh squeeze of lime makes everything better! Great photo, this looks delicious!! !